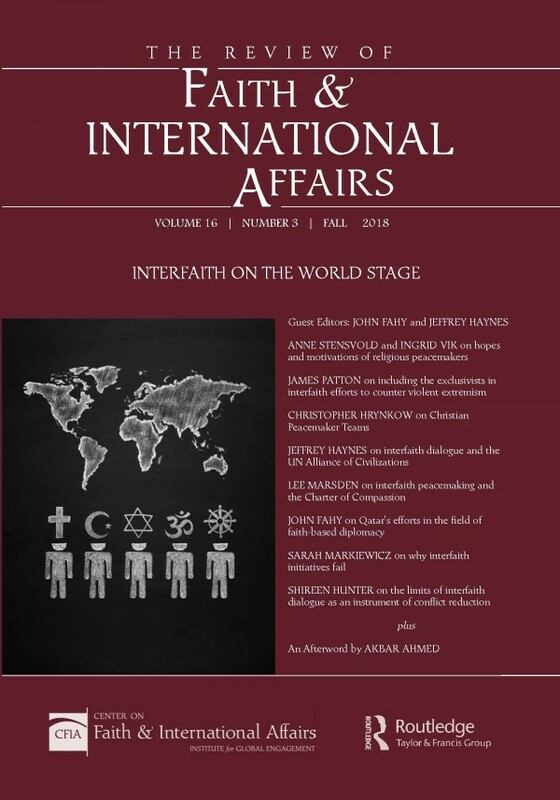 The fall 2018 issue of The Review of Faith & International Affairs is a special theme issue titled “Interfaith on the World Stage.” Guest edited by leading scholars John Fahy and Jeffrey Haynes, this issue addresses a significant oversight in contemporary scholarship and discourse about the “resurgence” of religion in world politics. Much of the discussion to date has focused on case studies of single religious traditions or movements, with relatively little constructively critical analysis devoted to the rapidly growing number of global initiatives and movements that are self-consciously interfaith or multi-faith in nature. In addition to articles by the guest editors themselves, the issue features contributions from a stellar lineup of scholars and scholar-practitioners, including Anne Stensvold, Ingrid Vik, James Patton, Christopher Hrynkow, Lee Marsden, Sarah Markiewicz, Shireen Hunter, and Akbar Ahmed.